Winter is arriving in Varanger - and Siberia is visiting. We are at the outer limits of Europe. Far east - further east then Istanbul - and far north. 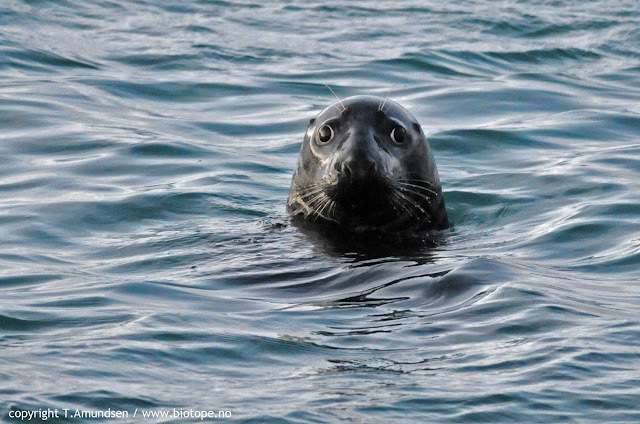 Varanger is truly a place of extremes. From 24-hour daylight in the summer with an abundance of life, and birds. It is for many the attraction of the north. 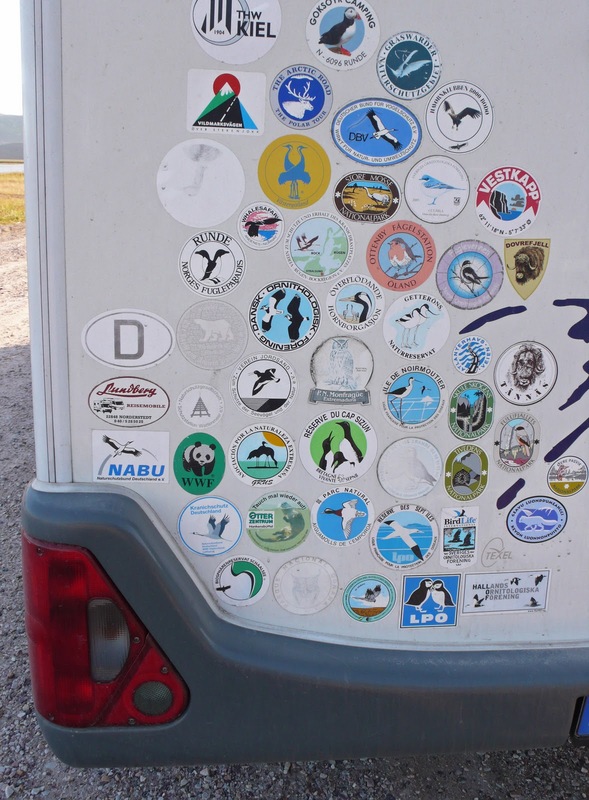 We meet quite a few birders in Varanger that have trouble with the midnight sun. You can actually go birding non-stop in the summer. On the other hand you have the arctic winter, with heavy snowstorms and near total darkness day and night. In these conditions there are still birds that thrive. Gulls are birds with phenomenal capabilities. Experts on flight - and survival. They are generalists that can adapt to people. In Vardø harbour the arctic gull species Glaucous Gull is just arriving. 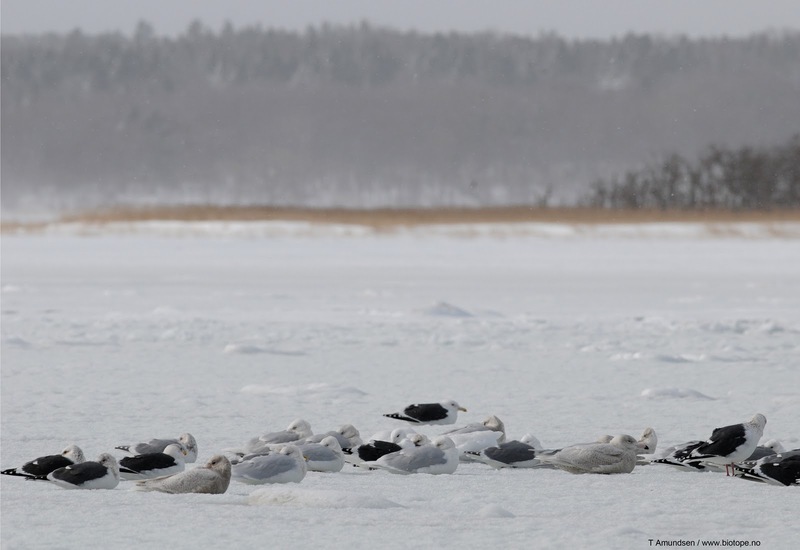 These are birds form Siberia. Aerial photo of Vardø harbour. 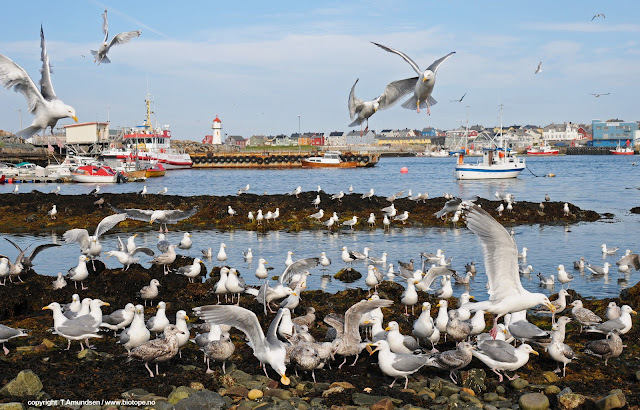 There are several fishing delivery fascilities here and these are of course favored places for gulls and many other birds (and mammals), like seaducks (King, Steller´s, and Common Eider), Longtailed Ducks, several species of Auk (the arctic Brünnichs Guillemot is often seen in the harbour). 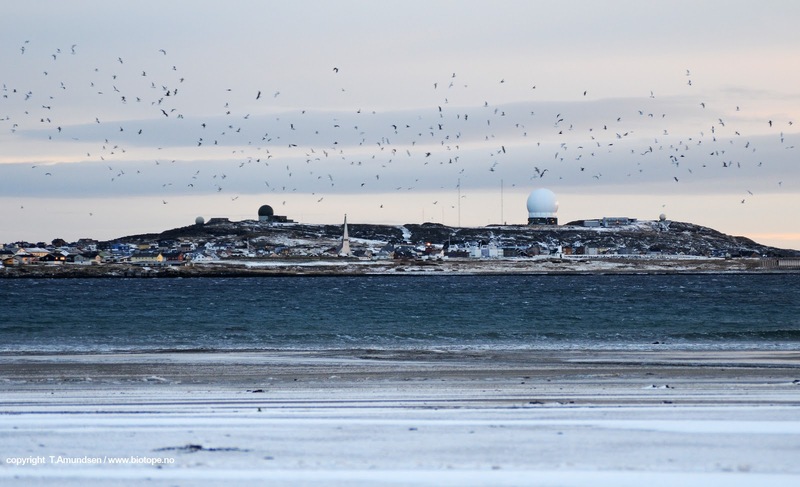 By the way: from our window (Biotope office, above) we have great views of the Barents Sea with thousands of King Eiders, and much more during winter and spring. 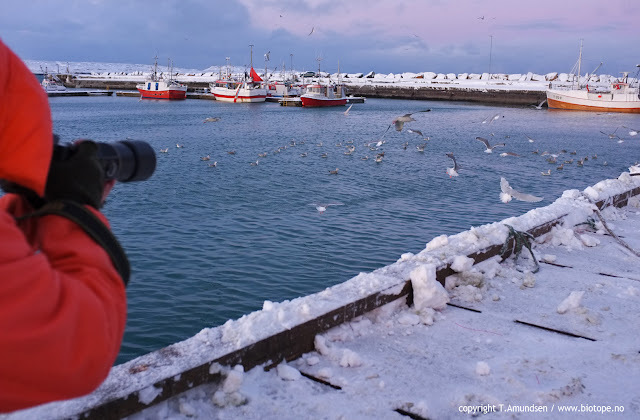 The harbour is one of the best places for birding in the winter, thanks to the local fishermen. 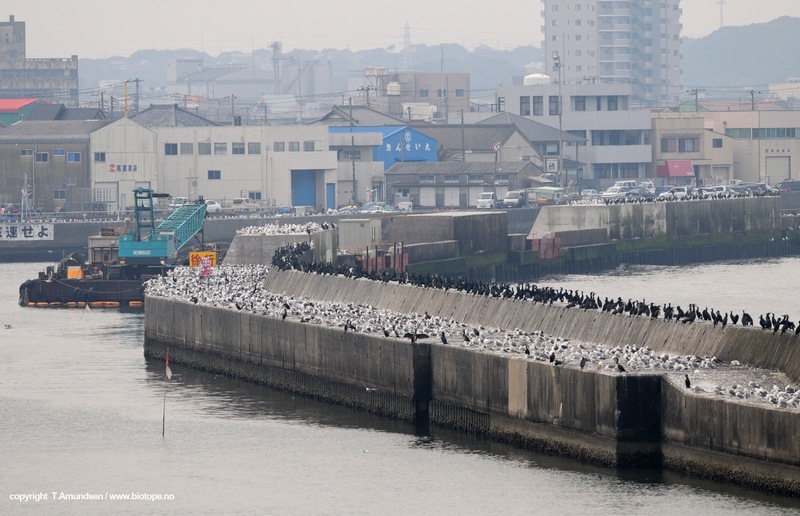 The breakwater (molo) is a favoured resting place for the gulls. photo from november 2010. 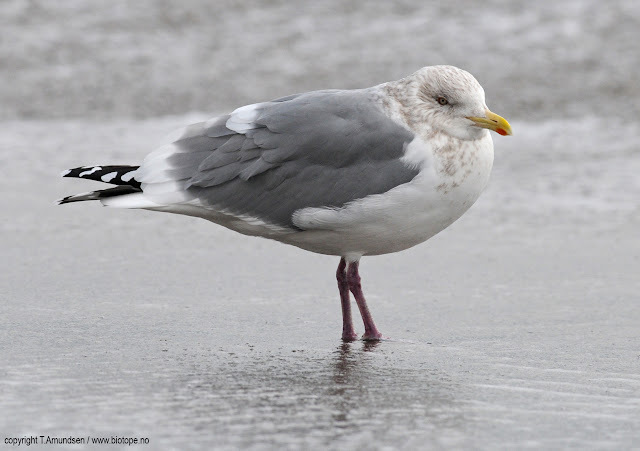 Species: Glaucous Gull, Iceland Gull, Herring Gull, Great Black-backed Gull. 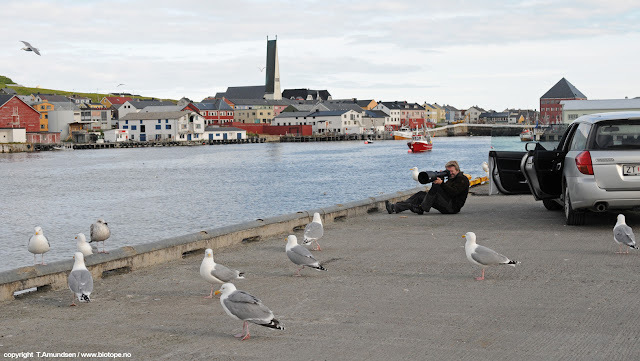 Gull enthusiasts will truly enjoy Varanger. Photo above is from november 2010. Thousands of gulls, the arctic Glaucous Gull is among the most common species in winter. 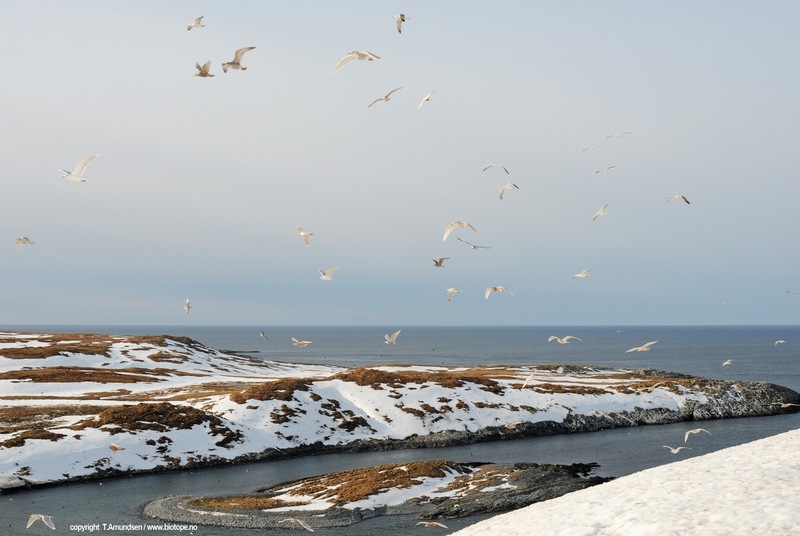 Bussesundet, between mainland Vardø and the Vardø island is allways full of birds. 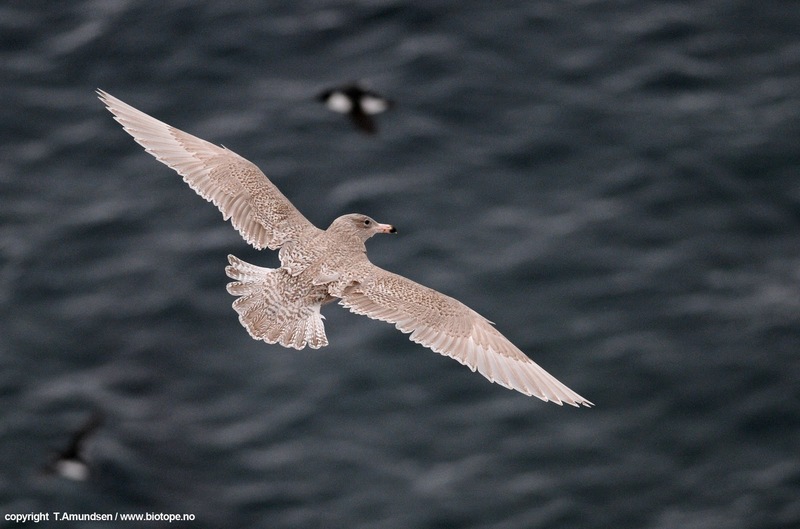 Hornøya birdcliff just outside Vardø town (10 min by boat) is the perfect place to study birds. When standing on the top of the birdcliff you have birds passing over and below, giving great opportunities for plumage studies and photography. Our day record count from Hornøya birdcliff is 3300+ Glaucous Gulls (late April 2011), and 25 Iceland Gulls, and tens of thousands of Herring Gulls, Kittiwakes and Great Black-backed Gulls. 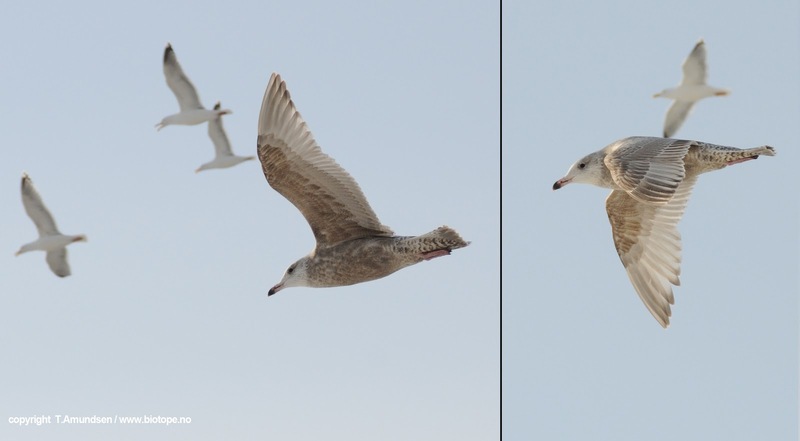 Photo: Glaucous Gulls above and below. Every once in a while a different looking bird will pass. 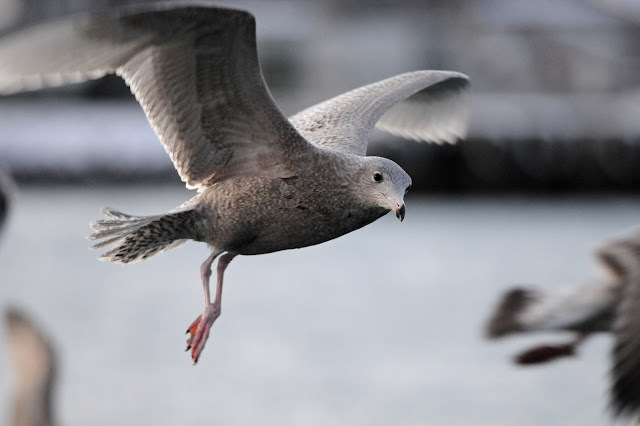 Like the above Glaucous x Herring Gull hybrid. Gulls are abundant in Vardø all year. There is allways the exitement in the possibility of finding a rarity. Gull study can be a very relaxing kind of birding. Throw them a bread or two and start scanning the flocks - however it is something for the more then avarage bird interested..
allways be found, and lots of rare birds have been found in Varanger. This Pacific gulls species, Glaucous-winged Gull (Larus glaucescens), was discovered by danish birders (Netfugl photo) in Kiberg on the 4th og July 2011 (Kiberg is a small fishing port 17 km south of Vardø). 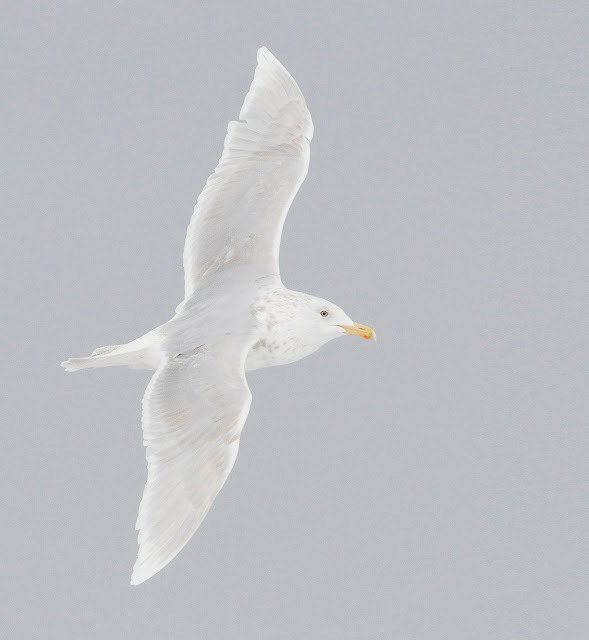 We re-found the gull in Vardø harbour ten days later, and got these photos of the record find: It was the first G-w Gull for Norway, and 7th record in the Western Palearctic (Europe). This record find off course deserved a page in the regional newpaper - after all it is not often Varanger have guests flying in from Japan - on their own.. Seeing one individual of this species in Norway is extrardinary and a great experience. 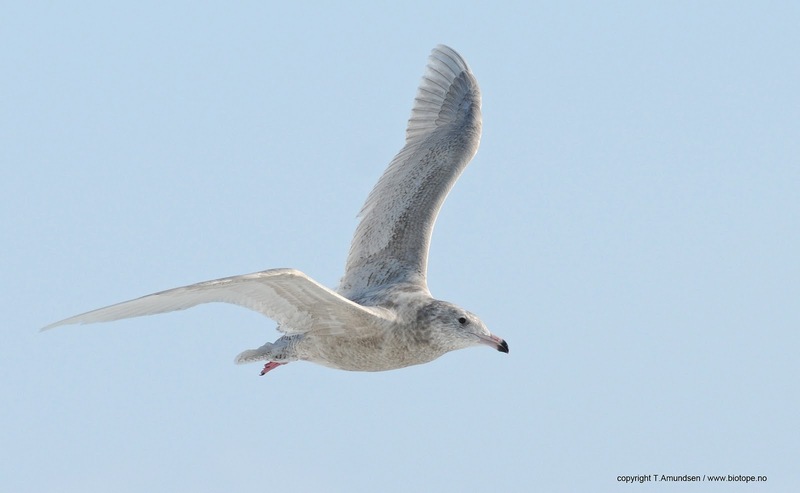 Still, a few months earlier we had seen thousands of Glaucous-winged Gulls in Japan. We went on study trip to Japan in February this year. A one-month fantastic trip from which we will make a more thorough trip report / post later. The aim of the trip was architecture- and birdwatching - a perfect match in Japan. Of course we visited the famous fishing port of Choshi - a great place to study and learn the eastern gulls. This is a huge fishing port close to Tokyo. 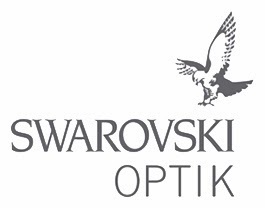 Well known for thousands and thousands of birds, and a high variety of species. 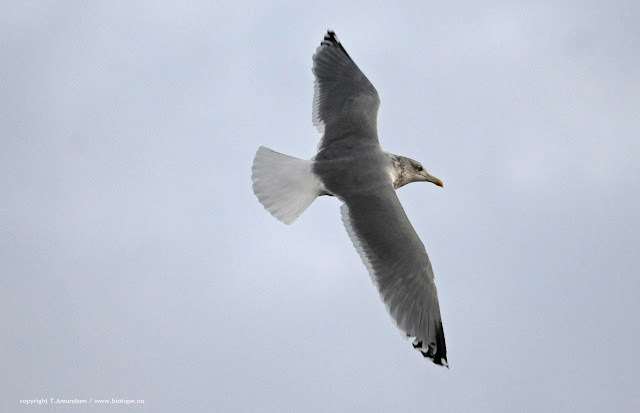 Photo above is Slaty-backed Gull (2cy + ad) Larus schistisagus. 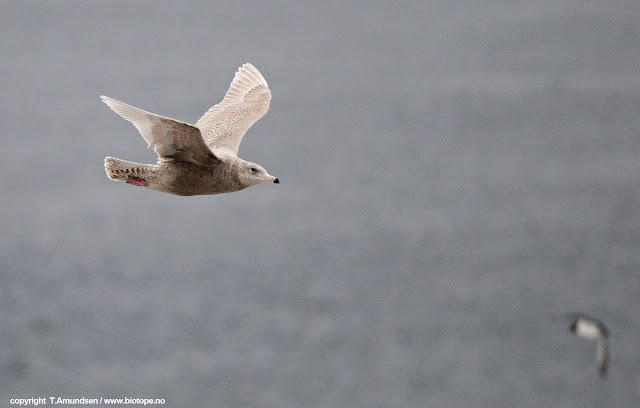 Could be the next new gull species in Norway? There are only a few European records as well. 2cy Glaocous Gull at Rauso fishing port, Hokkaido - Young pallidissimus looks slightly ´colder´ in colour then ssp hyperboreus found in Varanger. There is allways a lot to consider with gulls. There is allmost never a straight forward, solid ´truth´ with these birds. An endless challenge for the keen naturalists / birder. 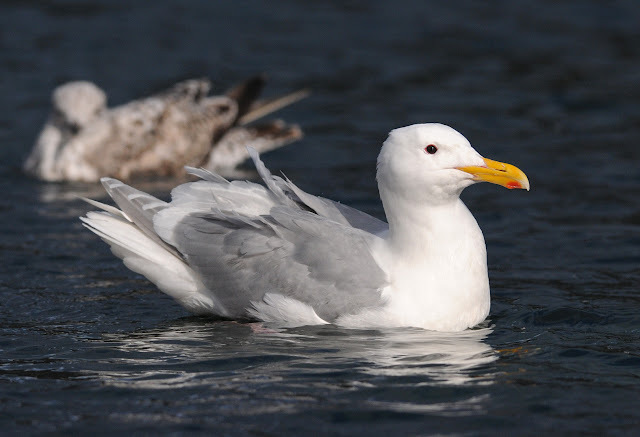 Large gulls vary greatly. 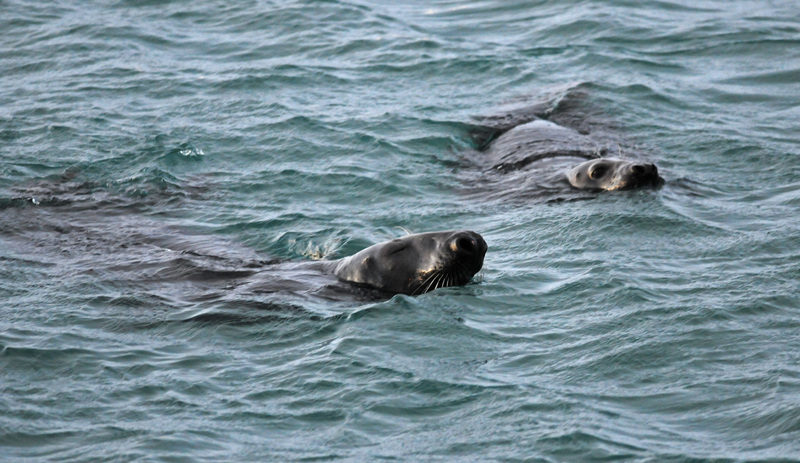 Even the smaller species vary geographically. Like the Black-legged Kittywake. The subspecies seen in Japan and the Pacific, ssp Rissa tridactyla pollicaris, seems slightly ´meaner-looking´ and rougher built then the atlantic Kittiwake R. t. tridactyla. 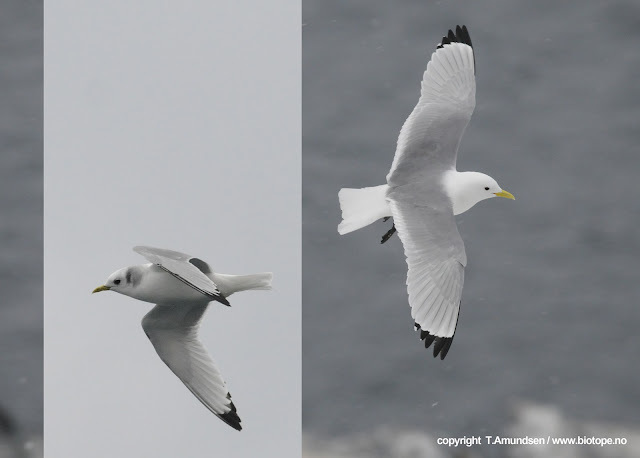 It also lacks the obvious two-toned grey upperwing of our Atlantic Kittiwakes. 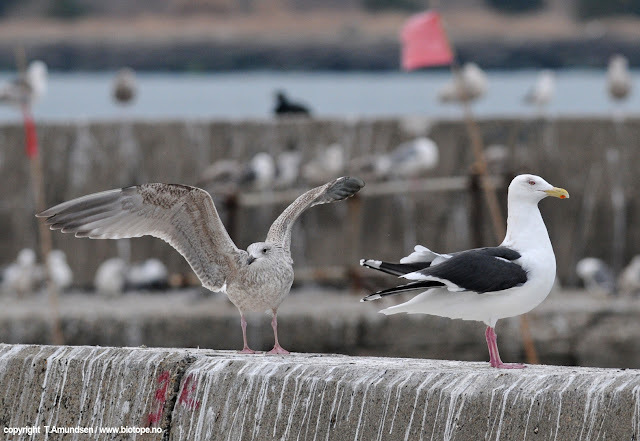 The Kittiwakes we found in Japan even seemed to have more extensive black on their wingtips. The hindneck/earspots are also obviously darker (near black and more extensive) in ssp pollicaris. 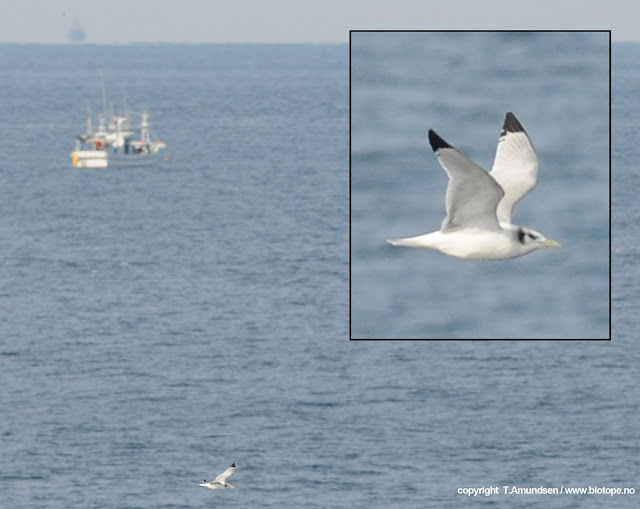 Photo above is the Pacific Kittiwake, and photo below is from Hornøya birdcliff, Varanger. 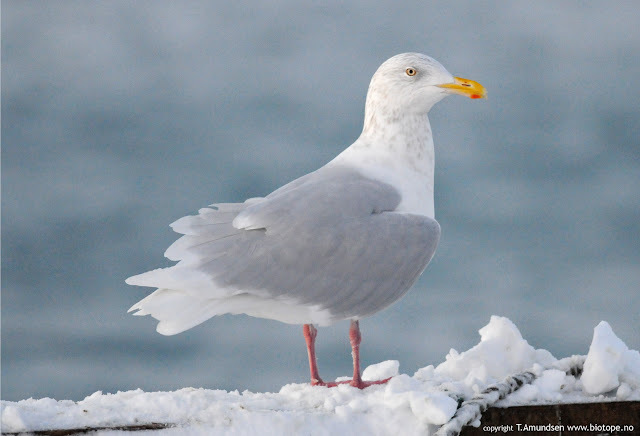 Subtle differences..
To our knowledge there is not yet been any confirmed observations of Vega gull, Larus vegae. I guess we can call this the eastern version of our Herring Gull, which breed and winter in Vardø in tens of thousands. The three photos below is Vega Gull in Hakodate, Hokkaido feb 2011. 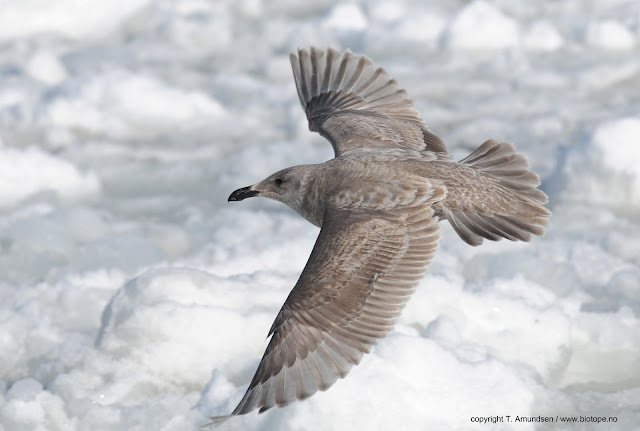 Vega Gulls actually breed quite close to Varanger, even west of Taimyr, Russia. Surely the reason there is no European records must be difficulty in identifying it.. Not that they havent strayed to the west. 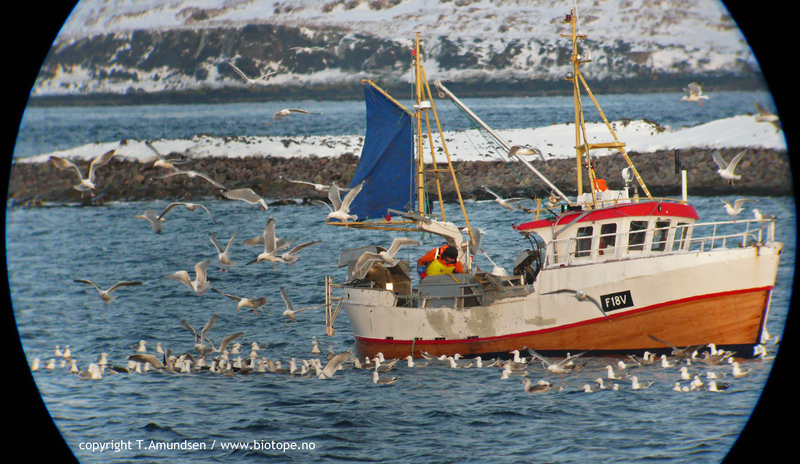 Vega Gull above, Herring Gull below (Vardø harbour, nov 2011). 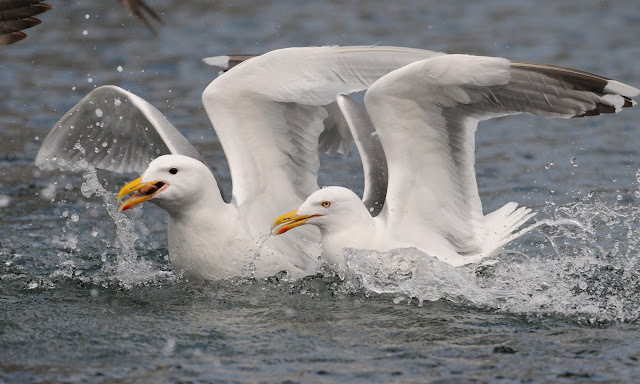 The variation in Herring Gull plumage is vast, and beiing able to see the very subtle differences is the key. Anyone up for it? Well, we enjoy the challenge of gulls, but perhaps finding Europes / WP´s first Black-legged Gull is an ´easier´ task - at least identification-wise.. 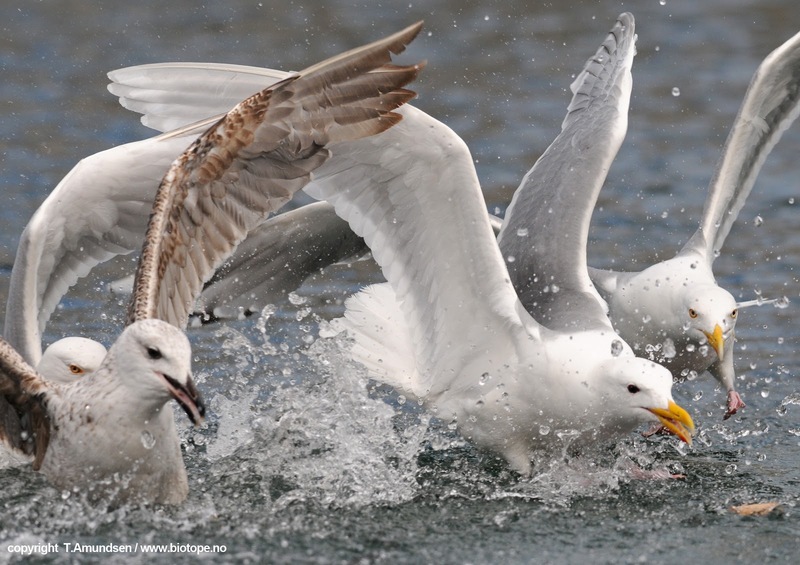 The photo below is from Malling Olsen and Larssons exellent ´Gull-bible´ the Gulls of Europe, Asia and North America (Helm, 2003). 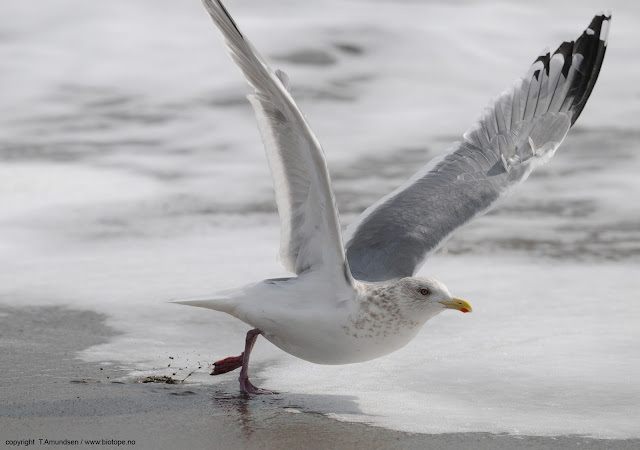 It gives some idea of the identification challenge.. Wingtip pattern is a key feature on large gulls. For the non-birding reader I have added a few links to give a glimpse of the world of Gulls. There are lots of great Gull websites and blogs around, this is just a few sites that show the enthusiasm these birds awake. 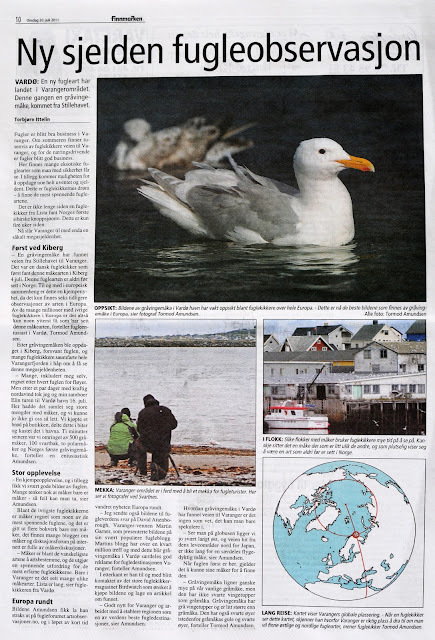 Check out: Larusology, Norwegian gull page, the Gull research Organisation, Chris Gibbins Gulls, Larus, Gulldk, Jeff Poklen Gulls, Newfoundland gulls and Punkbirder (just to add a little amiguity to the niceness of ´gullery´)..
Whats next for one of the greatest bird and gull places in Finnmark? Basically making sure that the rather small scale and sustainable, local fishingindustry prevails is very important. Thankfully this is the case in Vardø. The local fishing industry is doing well, and as opposed to many other places it is actually growing. 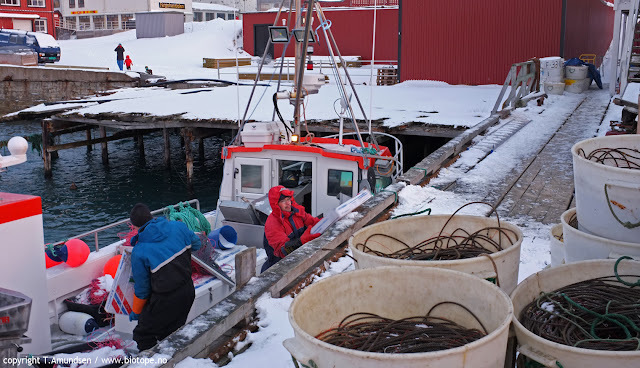 In Vardø this is small fishing vessels that deliver fish in Vardø harbour, of great quality from the fishing fields in the Barents Sea. However Vardø is a place that has seen much of its resources beiing taken over by big buisnesses and moved to the south. Taking care of Vardø as a fishing port can by no means be taken for granted. This is both politics, business and destination development. For us the aim is to engage in local development that will improve conditions for nature and the wise use of nature. 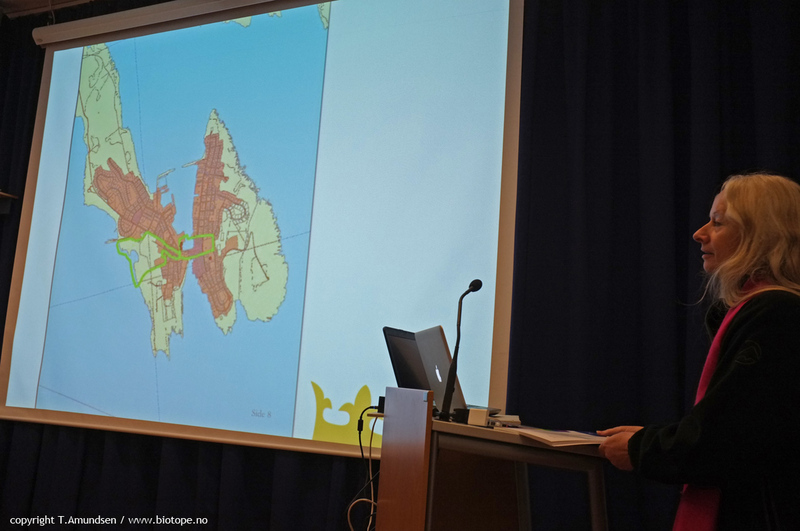 Together with a group of resourceful people we are now starting a project that aim to improve the harbour area in Vardø. With funding both locally and from the Directorate for Cultural Heritage (Riksantikvaren), we will register new potential in old harbour buildings and very targeted help owners to re-activate the buildings. This will be both by restoring and of course by removing and by building new. Vardø has a lot of unused potential, and it is important to build on the exsisting qualities - they are many, but not allways so easily seen. 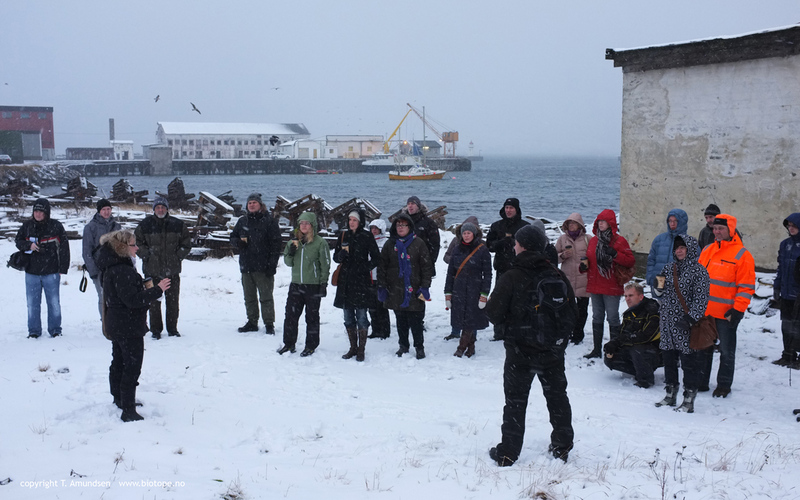 Check out this article by architect Gisle Løkken (in Norwegian) who recently visited Vardø. Photo above and the two below are from a recent city development seminar in Vardø. Standing to the right is Svein Harald Holmen, Vardøværing (Vardonian?!) and local project manager, with whom we collaborate on several projects in Varanger. He is great guy and truly a fixer with the best for Vardø in mind. Vardø harbour photo by Ellisif Wessel. At turn of the century 1800-1900. Living by the sea. 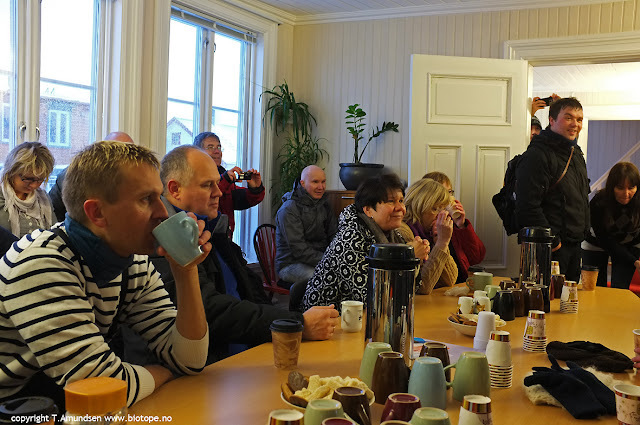 Today there is a new crowd in town: Nature-based tourism is up and coming in Varanger - for good reasons. There is no doubt that sustainable fishing and birding goes very well together. Varanger can offer intact nature and a spectacular birdlife. 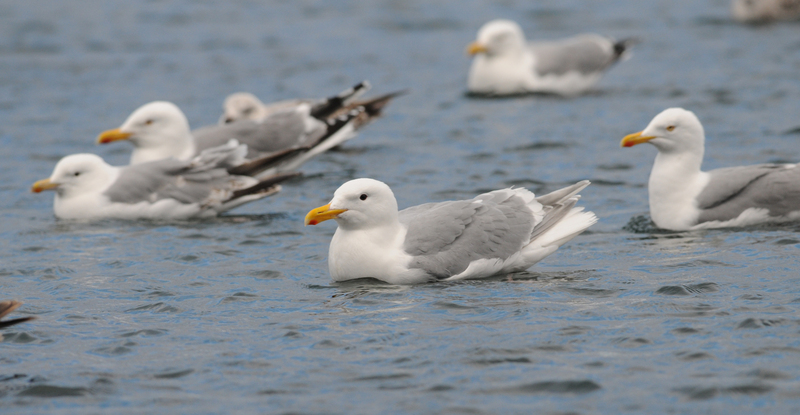 We are now working on many projects, among them is setting up a gull workshop next year, early spring (March / April). 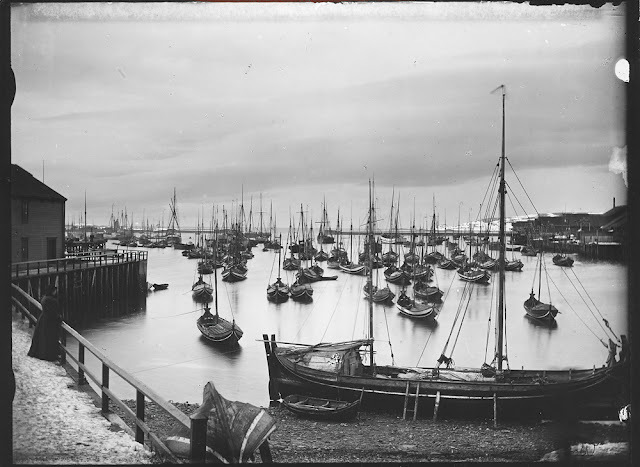 We will come back with more info on that - and obviously the local fishermen are of great value for this! Meanwhile we will be looking extra carefully at the gulls in Vardø harbour. 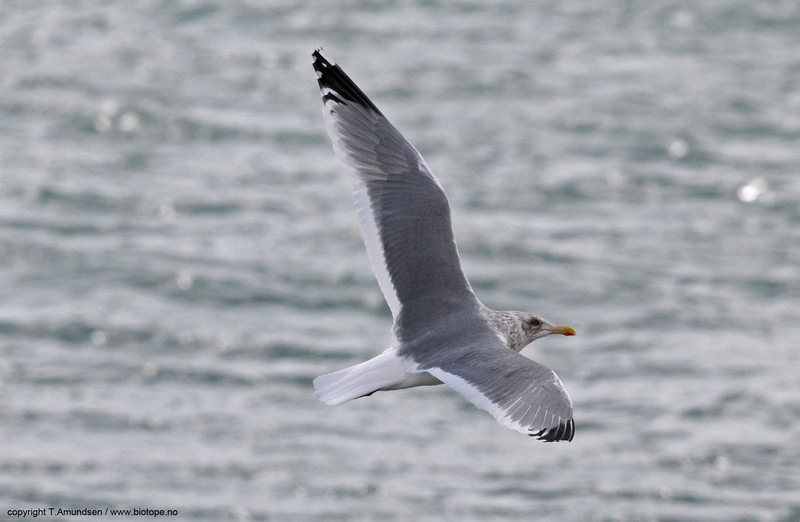 Note: There are a lot of gull identification discussions on various websites and publications. 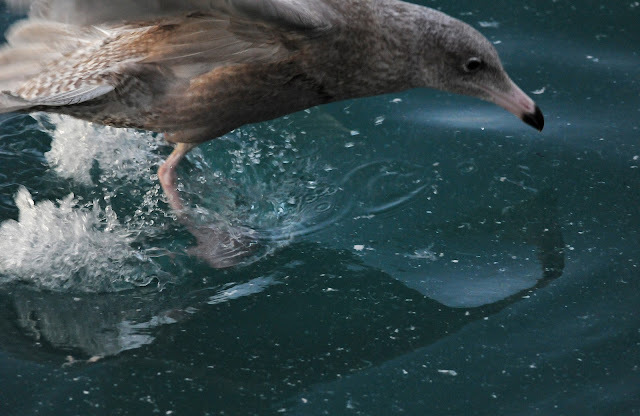 For those engaged in such all the gull photos in this blogpost is free to use, according to cc-standard. (please make a note on photocredit, and link back to the the biotope blog if possible). So feel free to copy, use, reblog, etc. 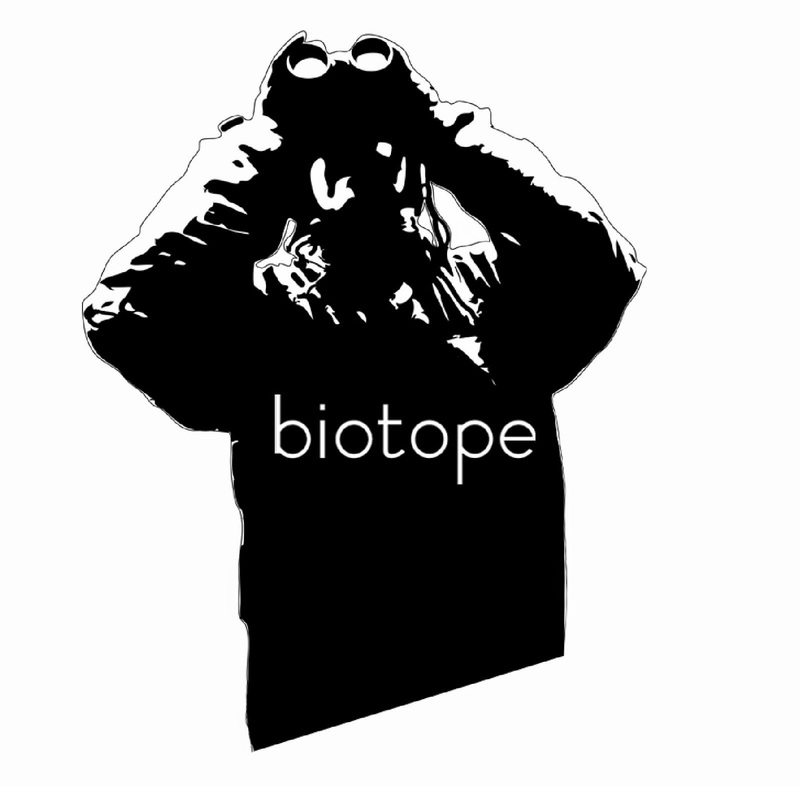 Just download directly from this post, or drop a mail to tormod@biotope.no if a higher resolution picture is wanted.